It was a year ago that Ben and I boarded separate planes to meet in Sacramento to host last year's Stance of the Union event and set off on the coastal road trip that acted as the catalyst for our recent west coast relocation. Following the show, we started on a road trip down the Californian coast through a torrential downpour.....in an E38 with a pair of busted wipers. When Olek heard we were making our way out to California, he offered us a ride and a tour through the mountainous coast. We had only briefly met at a show and interacted on the S|W forums, but that's the type of person Olek is. He's the kind of guy that will drop everything and extend a helping hand if you ever need it. We miraculously made it through the monsoon-like rain and the weather cleared up enough for us to continue our exploration through what Central California had to offer. There's nothing like busted oil pans, road trips, and car problems to bring you closer as friends and I can easily say that Olek became a great friend of mine that week as we cruised around in his E38. It was with great pleasure that I was able to reconnect with Olek at this year's H2Ointernational on the east coast, where he called home. After our visit out west, Olek returned home to Boston and later had his friend, Pavel, drive the BMW 740i cross country to start on the build he had stirring in his mind. Throughout our time in California, Olek and I discussed his plans for the build. Some of the ideas sounded crazy at first, but his passion and drive were evident so I had no doubt that he would pull them off. As I made my way to Ocean City, I found myself excited to see the car in person and see what it looked like with his plans unfurled. It did not disappoint. The build started with a set of wheels from VIP Modular. 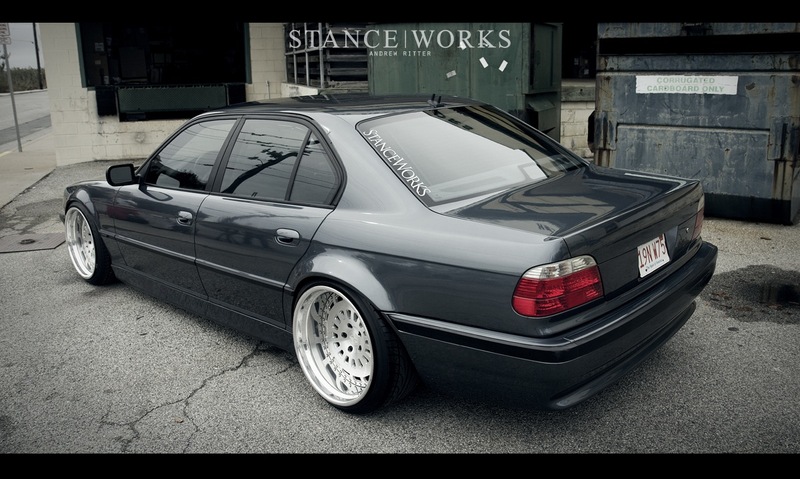 The specs were aggressive enough to draw skepticism from even the surest fitment enthusiasts. Olek went with 20 inch VIP Modular VX210s. With 10.5s up front and 12.5s stationed on the back, he opted for 245/35/20 and 285/30/20 tires. All of these spec numbers are higher than you'd expect for a BMW 740i, but Olek was determined to bring life to the build he had envisioned in his head. He was going to make it work. The car spent time at the bodyshop receiving all the necessary work that it would take to handle the 4.5 and 6 inch lips that sat under the car. With an OEM-esque finesse, the fenders were re-sculpted over the stretched tires and large wheels. 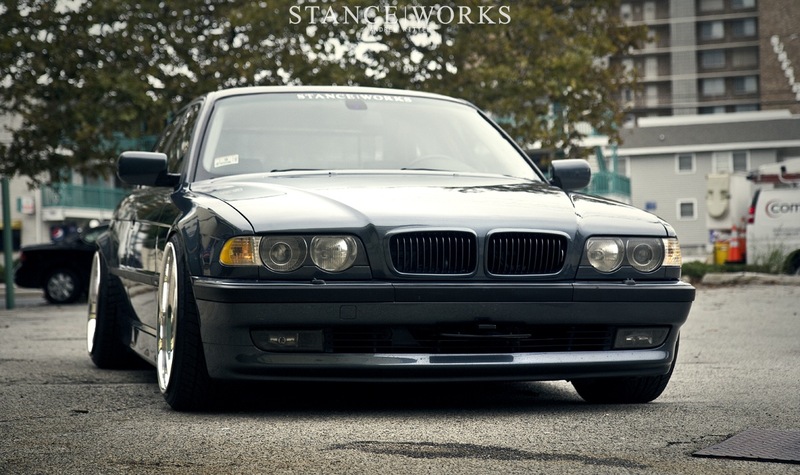 The added track width and subtle wide arches work eloquently with the wide, low-slung body lines of the E38. When you see it cruising out on the street you can't help but notice the aggressive stance as it contrasts nicely against the classy aura that the car emits. 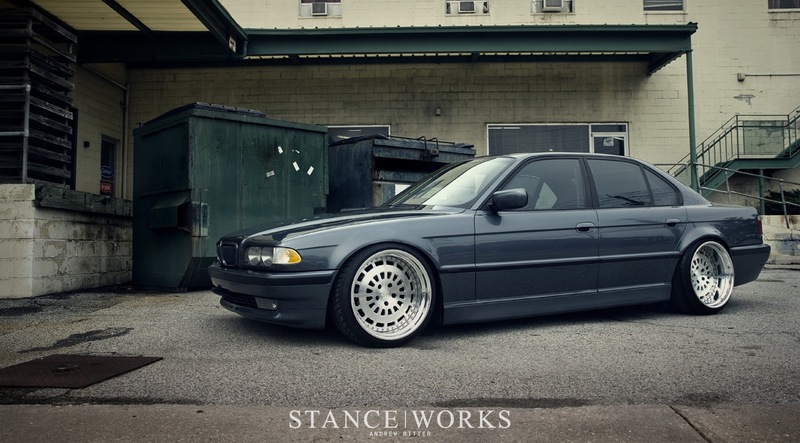 It's a fine example in the practice of balancing OEM+ styling and aggressive fitment. Olek was able to take a plan and a fitment that many were skeptical about and pull it off so well that it left them impressed. It's this kind of determination and drive that we really respect and it's clear that the results are worth it in the end. It's the friendships that you make through this hobby of ours that make it all worth it in the end. Olek, I look forward to when our paths cross again. Hopefully, it will be sooner rather than later, and you'll have some working windshield wipers this time around.